We moved house a few months back and to be honest are still exploring the local area. I popped into a newsagent that is quite near by just to have a look and to see if there was anything interesting stocked to write about here for Foodstuff Finds. 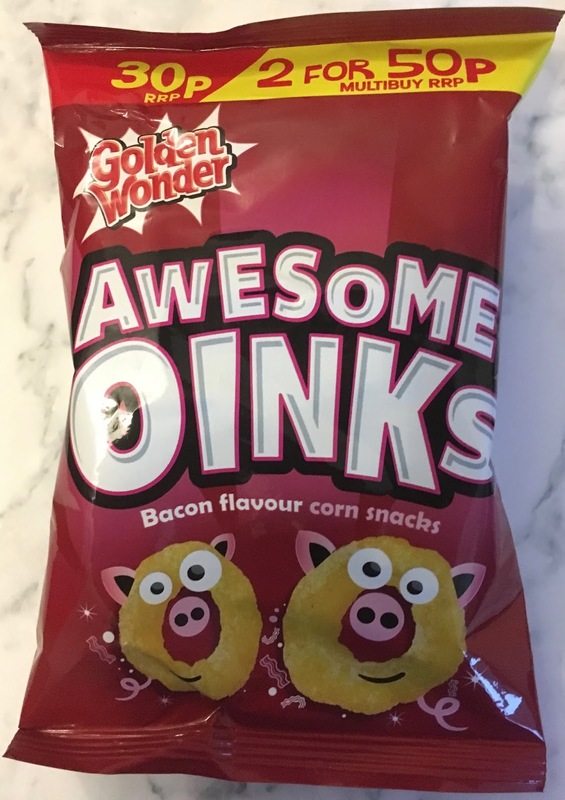 I spotted these Golden Wonder Awesome Oinks on the crisps shelf and thought that I hadn’t tried them before, but I couldn’t spot a “new’ label. I picked up a few bags (As they were on offer) and went over to the till. The lady behind the the counter chuckled at me and said, another Oinks addict? I asked her what she meant and she said that so few places stock Awesome Oinks that she had got used to people coming in her shop just for them, apparently they are hard to find in the wild. I said I’d actually just not tried them before and wanted something different, she told me I’d be hooked and be back back for more. This was a bit of strange conversation, and it made me curious about what I’d bought. 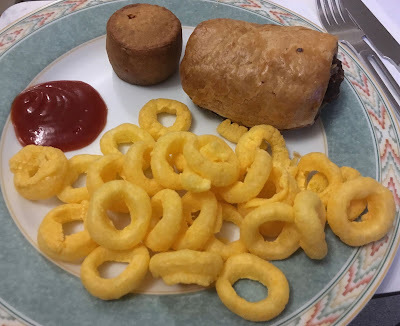 Once home we had them for lunch with a sausage roll and a mini pork pie, pretty much a pork overload in terms of flavours. I poured the Golden Wonder Awesome Oinks out of the bag and found crisps that were loops that looked and smelt quite appetising. I gave one a try and did really love them. They have quite a strong bacon flavour and they are quite salty too, but the meatiness was lovely. They may be a bit strong for some, but I was loving munching on them. The texture was from a baked crisp and was lovely and crunchy but light, this helped make them all the more moreish. There were a lot in the bag, but I still found myself wanting another, and I just loved there intense bacon meaty salty taste. I think the lady in the shop was right, I will be back for more. I may have to investigate other potato snack from Golden Wonder that are hard to find, I suspect there are quite a few not carried by the big supermarkets.